David Read and other fans pose with the Origins cast. GateWorld’s full coverage of Comic-Con continues! Click for more headlines. First there was the Stargate panel Thursday afternoon at San Diego Comic-Con … then there was the party! All work and no play makes Stargate fans grumpy, so Stargate Command and Legion M pulled out the stops for a celebration at the Harbor House. 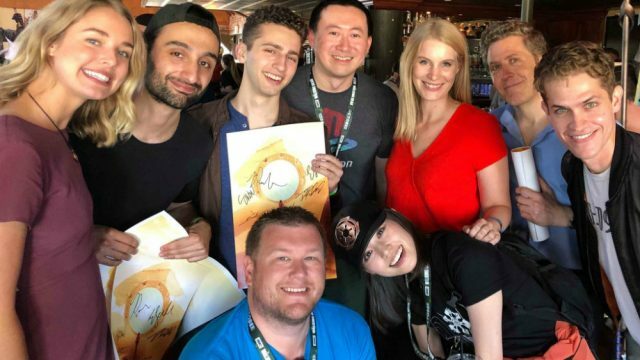 Fans attending the convention were invited to stop by for a change to hang out, meet some fellow fans, and mingle with the cast of Stargate Origins. First up was a trip downstairs, where Skybound Entertainment was live-streaming a special Stargate hour on its Gamma Ray channel. First on the couch was Stargate Command editor Kieran Dickson, who talked about the return of Stargate and the launch of MGM’s digital platform last fall. Then Christopher Judge (“Teal’c”) and Tony Amendola (“Bra’tac”) joined the host to reminisce about their years on Stargate and share their hopes for a revival. 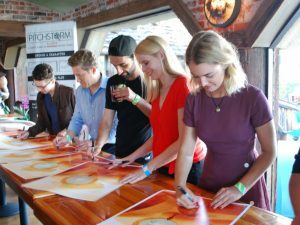 The cast of Stargate Origins make a movie poster signing machine. Upstairs at the party guests and fans were beginning to arrive, including six members of the Origins cast (many of whom drove down from Los Angeles for the festivities). Ellie Gall (“Catherine”) and Philip Alexander (“Beal”) were there, along with Aylam Orian (“Brücke”), Shvan Aladdin (“Wasif”), Daniel Rashid (“Kasuf”), and Sarah Navratil (“Eva”). I also met the great Sam Maggs, a long-time Stargate fan (and GateWorlder!) who hosted us for a live-streaming conversation at the Nerdist House on Friday morning. When the Origins posters came out the cast was ready! The six of them lined up to sign autographs (to be distributed to fans at the Midway screening end of the night), in a kinetic atmosphere with jokes flying and fans taking pictures. 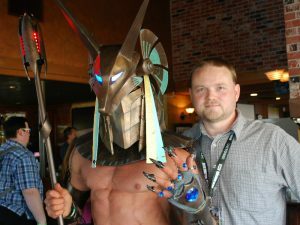 GateWorld’s Darren Sumner (yours truly) with the Anubis guard. Also on hand: the Anubis guard himself! Accompanied by his own cosplaying Samantha Carter as his handler, this fan turned up in a stunning Jaffa costume that stole the show. Cue the photo ops — lots and lots of photo ops! Head over to GateWorld’s full Comic-Con photo gallery to find more images from the evening! Still To Come: On the U.S.S. Midway with the cast of Stargate Origins!